I am authentically "Vintage." I am a child of the 60's and as such remember buying and eating so-called retro sweets from when they were not retro but new! Space dust popping candy, Flying Saucers, rhubarb and custard boiled sweets, jazzies, sweetie cigarettes in realistic packets- all these and more could be popped into a little white paper bag for munching at Grandad and Granny's while we did our best to stay invisible so we would be allowed to stay up until the National Anthem and the appearance of the Test Card on the TV. Yes. I am that old. I was delighted recently to be offered the chance to treat my tastebuds to a blast from the past by the lovely people at The Gobstopper, a UK-based retro sweety store where you can browse page upon page of yummy treats from the past few decades bringing lots of lovely memories back as well as making your mouth water! They had invited me to choose my three favourite sweets from my childhood. This was harder than I thought it might be with such a huge choice on offer. Flying Saucers were a must and I was delighted when I found they also stocked strawberry BonBons - I used to love watching the owner at Haden's reaching up for the glass bottle which contained the sugar coated sweets which start off hard and turn chewy. They seemed bigger when I was younger but then I realised - I was just smaller! My final choice was white chocolate mice - I used to love sugar mice but think my adult tastebuds would find them too sickly nowadays so I thought this was a good substitute! 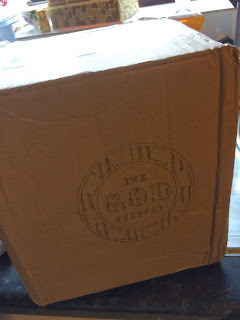 The parcel containing my choices arrived just before Christmas and I unwrapped it eagerly. Inside, the sweets were contained in a genuine glass Kilner jar labelled with a cute Gobstopper sticker. Visiting adults and children alike have admired the jar and contents so I think sweet lovers of any age would love one of these jars as a gift for any occasion. The Gobstopper website even sells a range of sugar free treats so would make a great gift if you know a diabetic who has more self control than me. I have type two Diabetes but still went for the full sugar version and have been fine eating a couple of sweets at a time as a treat. So if you are as old (or older) than me and fancy a blast from the past, or if you are younger and want to experience sweets from the good old days go check out the website and bookmark it - that's your birthday, wedding, anniversary, Easter and Christmas presents sorted out for the next 12 months at least! Disclaimer: I was sent a jar of sweets from The Gobstopper for free for the purposes of this honest, unbiased review. 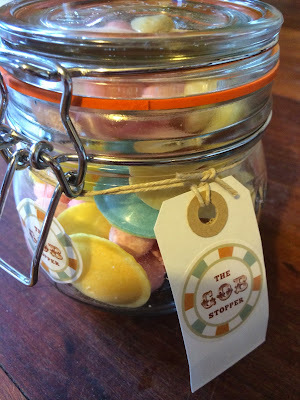 I reviewed the Gobstopper this year too - aren't they fab!? They really were! I ate the whole jar by myself.